Since I published this piece, I've since converted even more of my site over to CSS Grid. If you're interested in my take on how to "Fallback" with CSS Grid, check out my post Falling Forward — Rethinking Progressive Enhancement, Graceful Degradation and Developer Morality from January. With the death of Lella Vignelli last week (Dec. 21, 2016), I read for the first time The Vignelli Canon. The Vignelli Canon is amazing for a whole host of reasons other than just it's simple layout. If you're interested at all in design, please read it. The layout of the pages inspired me. I knew that I wanted to give a quick update to some of my blog posts to mirror some of the design from that book – a book that talks about grids, as well. 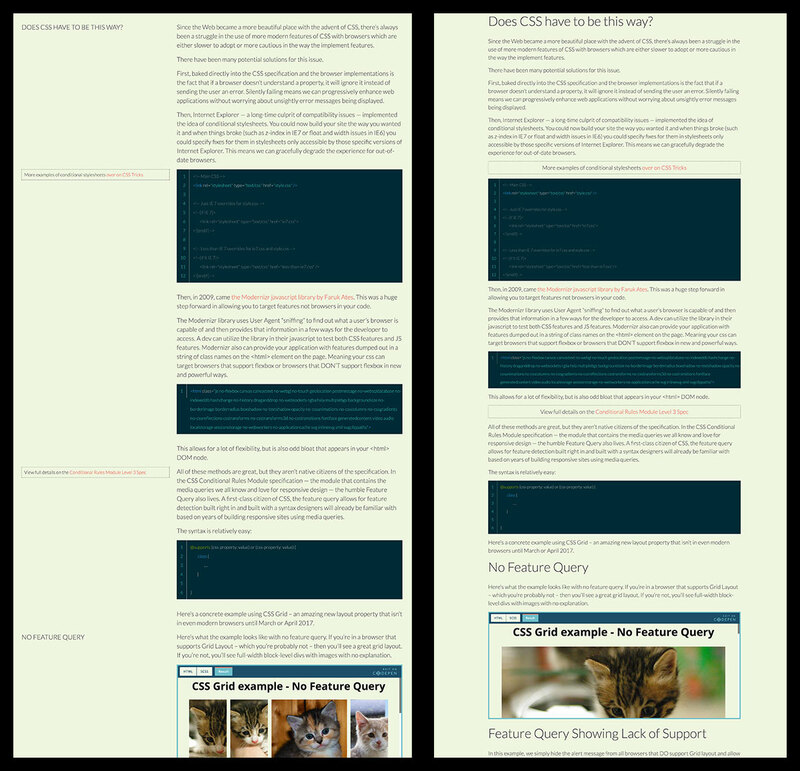 To do this, I decided to convert my blog posts to CSS Grid Layout. With the release of this blog post, I’m also releasing the updated code into the wild. Author's Note: This is no longer an issue. This was a problem of a percentage width being set on my right-side content. Apparently, percentage widths are not friendly toward grid height calculation. This is a super simple implementation and doesn’t look quite right in the Firefox Developer build, due to height bugs (more in author’s note), but it’s really nice in other experimental browsers – such as Chrome with the experimental flag checked. I’ve only converted one other blog post to the new layout at this point. Fittingly, it’s my post on Grid and Feature Queries. If you're looking at this and all you see is a centered column, your browser doesn't support Grid yet. Find out how to enable Grid to see this as intended. I won’t dive into too many details, but here’s a snippet of some of the CSS I’m using to accomplish this layout. If you're interested in more, here's a CodePen where I'm experimenting more with layout. This is also where I started laying this out. 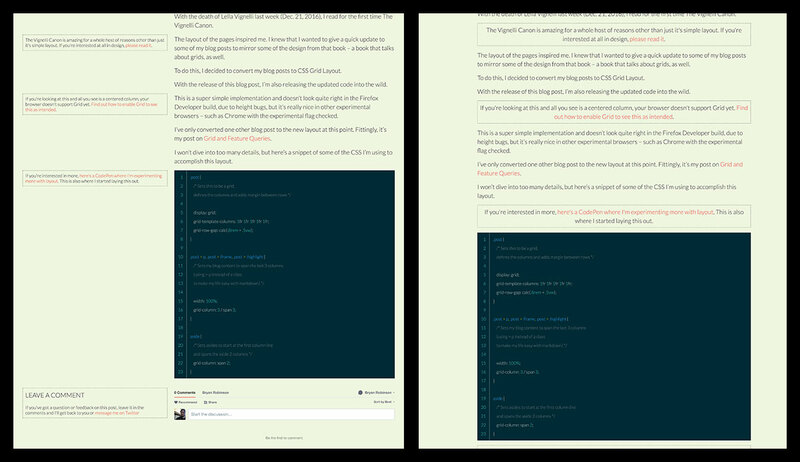 For those that don’t want to deal with adjusting the flags in their browsers to see both versions, here are two side-by-side examples of the differences in the blog posts. Edge supports Feature Queries, unlike its predecessor. So, it was able to see my Grid declarations. To fix this for my Edge viewers – since Edge has a VERY broken implementation of Grid – I implemented a second level of Feature Query to account for browsers that support Grid (which Edge TECHNICALLY does) but also don’t support -ms-grid (which Edge does, as well) to keep Edge from seeing display: grid. Thanks to the excellent @gregwhitworth on Twitter, I have a much better feature query that will allow Edge to see the Grid when the newest version releases. Updated to the right.